After receiving my undergraduate degree in Biochemistry from Texas Tech, I then proceeded to attend the Texas A&M Baylor College of Dentistry in Dallas, TX, where I earned my DDS in 2006. 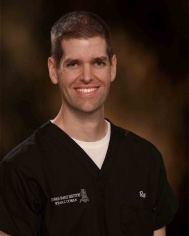 I have been providing the Hill County community with quality and attentive dental care since 2009. I was born in Lubbock, Texas in 1978. I attended Lubbock Christian High School, graduating in 1997. I attended Texas Tech University, graduating in 2001. In June of 2002, I married my sweetheart, Kerista Harris. Kerista and I have two daughters, Ella and Kaitley. My family and I love to play golf together. I would describe myself as a technology geek – I love Apple computers and am always looking to add technology to my office or home. I have always insisted that my patients be “treated like family” when they enter the doors of Cowan Family Dentistry. My staff has been praised for being friendly and courteous and is dedicated to making every trip to the dentist a pleasant one. The friendly atmosphere of our practice has put many patients at ease during a potentially anxious trip to the doctor. Because of this energy and compassion toward patients, we have become one of the Hillsboro community’s favorite dental practices. In addition to prizing the way that my patients are treated, I also believe in practicing dental excellence at my Hill County practice. Patients will receive high-quality care through methods tested by dental professionals everywhere. By combining dental/periodontal care with practical patient education, I give my patients a smile that they can be proud of, and teach them exactly what they can do to maintain it. In the interest of preserving the family-oriented environment of Cowan Family Dentistry, I’ve decided to extend my staff’s catalog of dental services to patients of all ages. From children age four, through folks that are already enjoying retirement, everyone in the Hill County area can enjoy a great checkup at Cowan Family Dentistry. Outside of the dental practice, I enjoy time with a family of my own – a wife of over 12 years and two lovely daughters. As an active member of the Hillsboro community, I have served as the Chamber of Commerce Chair, President of the Hillsboro Rotary Club and am a Lions Club member. To relax in my down time, I will play a few rounds of golf or enjoy some classical music from my collection. Tammy and her husband of 34 years, Wayne, are the proud parents of four children, and the proud grandparents of eleven. In addition to making new memories with her big family, Tammy enjoys other personal and social activities – she loves spending time with her church family from Waco and finding new treasures at antique stores. In her spare time, Tammy enjoys relaxing on her family’s small ranch, and loves spending time with the horses, cows, and all the other creatures that come along with country living. Ashley was born and raised in Waco, Texas. She instinctively knew from her first trip to the dentist that she was drawn to dentistry. She became a Registered Dental Hygienist at Texas State Technical College in Harlingen in 2004. 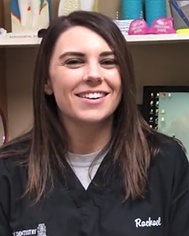 Ashley feels that educating patients on maintaining their oral health is the most important part of her job, and she is fantastic at making her patients feel comfortable. 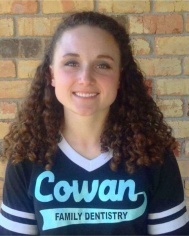 Ashley loves helping others both at work and in her free time, serving as a volunteer with Community Hospice of Texas. Today she resides in Cleburne with her husband, Matthew, and their adorable pugs. She enjoys traveling, cooking, and hanging out with friends and family. A Houston, TX native, Sheila moved to Central Texas at age 12. 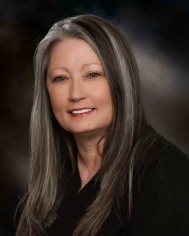 She attended Texas State Technical College Waco for her certificate in dental assistance and has been in dentistry for just over four years. Sheila loves every aspect of dentistry and has already been praised by her patients for being a “caring and compassionate” dental assistant. Dr. Cowan sees Sheila as one of the kindest and gentlest assistants that he has ever worked with. Sheila truly loves caring for other people, which shows in the relationships she has formed with her valued patients. She currently lives with her husband and their two teenagers, Destiny and Chris. She loves cooking, spending time outdoors, working out, and rooting on her favorite football team, the Dallas Cowboys. Leah was born, raised, and still resides in Grandview, Texas. 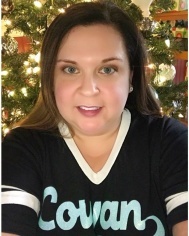 She started at Cowan Family Dentistry as an intern while still in high school, going on to become a very knowledgeable and skilled Registered Dental Assistant adept at answering any questions or concerns patients may have. Leah loves to help patients with all of their dental needs, but her favorite procedures are fabricating custom-made crowns and assisting with short-term orthodontics. Education is very important to her and she is in the process of obtaining her college degree. Leah is a member of the Grandview Church of Christ, where she enjoys teaching children’s and women’s Bible classes. Leah also loves to hunt, fish, and spend time with her friends and family. Rachael grew up right here in Hillsboro. Rachael graduated from Kaplan College to become a dental assistant in 2014. 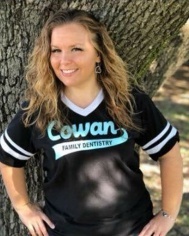 She joined Cowan Family Dentistry in 2018. Her favorite things about dentistry are surgery and interacting with all of our sweet patients. In her free time, Rachael loves being with her family, spending time with her daughter, and watching baseball.